For a couple decades now I have played cello on many recording projects and even produced a few myself. Most often nowadays, I record myself here at my home studio- Cellomax Studio. I really enjoy the creative process of working closely with musicians and producers from all over. There’s a sweet spot about the size of a salad plate from just below the bridge and encompassing the lower part of the fingerboard. A little towards the A-string side and about 1/2 to 3/4 of a bow length away. This gives a bright full sound which records well. I got this after a lot of trial and error and it was confirmed exactly when I talked to Nashville cellist John Catchings who has done as much studio cello work as anybody on the planet. Set the mic about bridge height and 14-22 inches away depending on how much of the bow noise you want. Too close can become boomy. 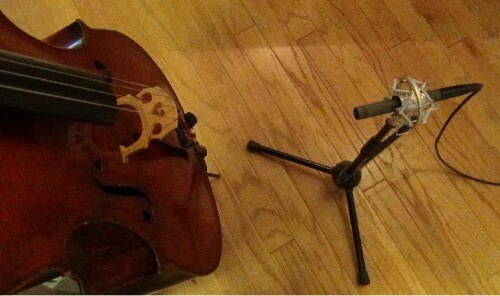 The angle of the cello to the mic also makes a huge difference. You get a brighter, better sound when the mic is not perfectly perpendicular to the belly of the cello The mic should be a little off axis to the cello- and that’s the way we sit with it anyway. This mic placement is a bit more refined. 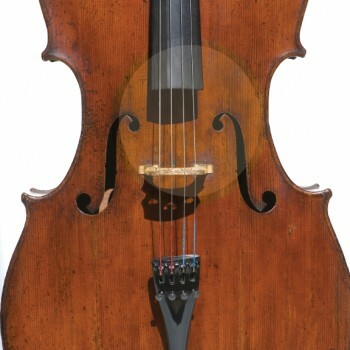 Even with the bottom of the f hole, (about 20 inches off the floor) and 16-22 inches away (closer is warmer, too close gets boomy) pointed towards the right F hole or slightly towards the middle of the cello. This is a smoother and more complex sound that lacks some of the rawness of the bridge placement. The mike is also closer to the hard floor so it picks up more of the “early reflections” which lend clarity. This lower placement about 20-25 inches away gives a sweet clear sound. The Champion Sisters: Unconditional Love (excerpt) from “Not Fit to be Tied”. (Recorded by Andy Bradley at Sugar Hill Studio, Houston) 2011 album. My favorite to mic for cello is Schoeps CMC6 with the mk41 hypercardoid capsule. This is a great orchestral spot mic for cello and in my opinion, you won’t find a better one. But expensive. I got one second hand for $1200. I record here in my home studio with it thru a Summit 2BA 221 pre amp. It has a high pass filter so I roll off the bottom from about 70hZ to get rid of any unwanted rumble. Plus you can use it live and drive a mic and a pickup simultaneously. Nice clean warm tube sound. For stereo recording I have a matched pair of Peluso cardiods that I like to place in a 20-22 inch equidistant triangle towards the bridge. John Peluso worked for Schopes for many years and his mics are great and surprisingly comparable to Schoeps but at a fraction of the price. I use Sennheiser earphones don’t cup the ear but are flat so I can position them to leak in sound from the outside so I can hear the cello acoustically when I record. Many studio string players just use one ear. It’s better that the sound guy doesn’t give you much of your own sound in the headphones. If you hear too much of the cello thru the headphones you will play too quietly and the cello doesn’t record as well. Better to hear less and play out so the cello resonates fully. Most studio headphones are big and clunky and get in the way of your pegs so get your own headphones that are small and hi quality and get comfortable with them. Ethan Winer has a terrific site devoted to room treatment and acoustics. He is also a cellist! If you are interested in getting your room to sound much better, check out his site HERE. He sells a full line of acoustical treatments and also tells you how to acoustically treat your room build your own bass traps. This is a whole big discussion and I hope to devote an article to how I built my home studio . This is a huge topic and I only want to say that the first thing you need for good classical recording is a decent room or hall since the microphone placement tends to be farther away for a smoother recording and you want to hear more of the natural reverb of the hall. “6 feet up and 8 feet away” was the default placement for the Houston Symphony audition recordings. For live sound I use the DPA 4099-C. microphone. I have tried a million clip on mics and pickups and this is the best. It clips on behind the bridge and I point it toward the soundpost and slightly off axis (unlike the photo on the DPA site). For club work I use a Acoustic Image Coda R with my DPA mic. Very transparent and sounds great. I put it away from my on the other end of the stage so I don’t hear too much If there’s a sound man I generally just put the mic thru the house PA- You really don’t need your own monitor on stage- you usually hear plenty acoustically. With a drummer in a loud situation I use in-ear monitors which keep the volume down and saves my failing ears and also permits me to hear myself. You will need to get the sound man to give you a mix you can work with as well as your own cello sound- getting the right volume of your own playing is extremely important so you can play freely. 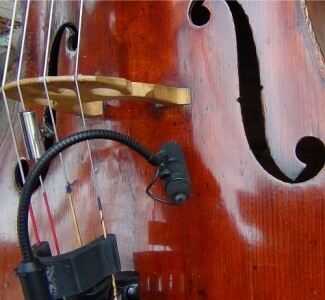 NY Cellist Eric Friedlander has a ton of good info HERE about live sound and miking. Check out his excellent site. Hearing my own cello sound in the orchestra pit has become more problematic in recent years since my hearing has started getting worse. When I have to sit next to the piccolo (and in front of the timpani) in the pit for the Ballet I use an in ear monitor in the left ear to block the sound, I bring my little self monitor. Sound Devices MM1– I run my DPA mic thru it to provide phantom power and to drive my earphones. Uses 2 AA batteries and clips to your belt. A bit heavy, but a solid professional piece of equipment. It has a monitor mix 1/4″ input which you can balance against your own sound. I used this very effectively in performances of the Lion King. Such a pleasure to hear those great drummers and I could synchronize my playing easily. I use Westone ES5‘ s but you can get decent in-ear monitors for less. Sennheiser IE4 earbuds are great too if I have to sit in front of the brass and I can choose how deeply to block my ears with them. It makes a huge difference if you can hear yourself clearly in the orchestra. Plus it’s really important to save your hearing!